The Haven on the Norwegian Escape cruise ship is a private key-card-access enclave for those guests staying in one of The Haven suites. Located on decks 17 and 18 forward, The Haven features the ship's most luxurious accommodations, along with a dedicated restaurant, courtyard, bar, concierge, sun deck, and 24-hour butler service. The Haven is Norwegian Cruise Line's way of offering the level of service and amenities usually only seen on small boutique ships inside a giant, resort-style cruise ship. Guests staying in The Haven enjoy benefits such as priority embarkation and debarkation, priority tender boarding, espresso/cappuccino machine in each suite, gourmet pillow treats delivered each evening, and luxury linens and in-suite amenities. Ninety-five suites have access to The Haven on the Norwegian Escape. Sixty-nine of the suites are located inside The Haven, and 26 are located outside The Haven, but guests in these forward or aft-facing Penthouses can visit The Haven complex with their room key card and enjoy the same amenities as the guests staying inside. The two-story Courtyard in The Haven has a retractable roof, a swimming pool, two whirlpools, private sundeck, private spa treatment rooms, changing areas, and a sauna. The Haven Courtyard also has some very comfortable, relaxing seating areas. Lounges like this one look very comfortable and romantic, don't they? Some guests love to have a place to nap or read a book. Located inside The Haven complex, The Haven Restaurant is a private, fine-dining experience for the guests staying in the 95 suites of The Haven. The Restaurant serves unique dishes and has some interesting wine selections. Those staying in The Haven can also eat in any of the other 27 dining venues on the Norwegian Escape. In addition to the suites, restaurant, and courtyard, The Haven complex on the Norwegian Escape also has this nice indoor lounge for the enjoyment of the guests. Inside the lounge is The Haven Concierge desk, where guests can make dining, spa, or entertainment reservations. The four Deluxe Owner's Suites on the Norwegian Escape is the cruise ship's largest and most luxurious accommodations. Measuring 1,345 square feet, these suites have a living room with a dining area, wet bar, guest bedroom with luxurious bath, separate bath, and two balconies. As one would expect, the master bathroom in the Deluxe Owner's Suite in The Haven on the Norwegian Escape cruise ship is large and luxurious, with two sinks, lots of marble, and separate tub and shower. 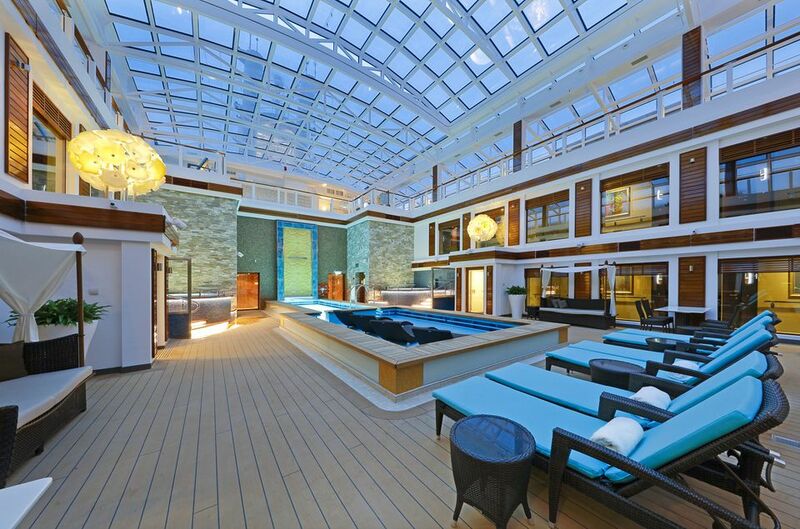 The Norwegian Escape has four Owner's Suites in The Haven. Measuring 572 square feet, these suites have a separate bedroom with bath, living and dining area, balcony, and a half bath for guests. The separate bedroom in The Haven Owner's Suite is nice-sized, with a king-sized bed and a large connecting bath. The forward- and aft-facing Penthouses on the Norwegian Escape cruise ship are not located inside The Haven complex, but guests staying in these 451-534 square feet suites have access to all the exclusive amenities. The suites have a separate living/dining room and bedroom with bath. Because of its location, this forward-facing Penthouse Suite on the Norwegian Escape cruise ship has a balcony located off its separate living/dining room and these slanted windows in the bedroom. The Haven on the Norwegian Escape has 25 Two Bedroom Family Villas that sleep up to six guests in its two bedrooms, two bath space. These 540-square foot suites have private balconies and large floor-to-ceiling windows. The master bathroom is huge, with a luxurious shower, two vanity sinks, and an over-sized bathtub.